In December 2017, Google doubled its character-limit for meta descriptions. This means that we now have 320 characters to play with instead of just 160. Now, to the average onlooker, this increase from 160 to 320 probably seems like a small and insignificant change. 60ish words instead of 30ish. Hardly a revelation. But for those of us working in marketing and SEO – in fact, for anybody who owns a website that sells things – it is in fact a big talking point. The previous 160-character limit meant that we had to be succinct and snappy with our meta descriptions, and sometimes we’d need to chop and chisel them a few times before they would be shorter than 160 characters yet still convey their messages clearly. In some instances, 160 just never seemed enough, and we therefore had to compromise. Alas, that headache is no more, because summarising a webpage in 320 characters is actually a doddle – we’ve written a few here at theEword since the increase (for ourselves and for clients), and we’ve had no trouble fitting everything in. But just because we have this extra space now, do we need to use it? Your instinctive reaction is probably a huge of course, but let’s think about it properly. Surely there’s still something to be said for being economical and to-the-point? There is. Then again, with twice as many characters at our disposal, we’ll be able to describe our products or services in much more precise detail now – right? It’s hard to argue with that. The meta description’s main job is to convince the searcher that your page – out of all the other search results – is the one that they should click through to. It therefore needs to persuade and tease. Simultaneously, it needs to summarise your page accurately, so that the searcher has a clear idea of what they’re clicking through to. If your meta description is enticing but ultimately turns out to be misleading, the searcher might click through but will probably then just leave straight away, bouncing back to their search results and choosing someone else’s site. In short: honesty is key. So, will a longer meta description do a better job? 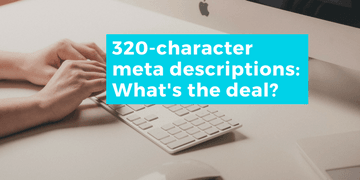 When I found out about the increase to 320 characters, my first thought was that we’d need to ring all of our clients, tell them about this, and talk them round to letting us rewrite (lengthen) all of their meta descriptions. Modern searchers want to find what they’re looking for without having to put much effort in – and that includes spending time reading. Also, 52% of all internet browsing (worldwide) takes place on smartphones. As the graph shows, desktop had an 82% overall share back in January 2013, but mobile has overtaken it in the four years since, so it’s clear that we need to start pleasing mobile users with convenient experiences both on the mobile versions of our websites and in the mobile SERPs (search engine results pages). Poll time: longer or shorter? With that in mind, I conducted a mini poll within my team of eight content marketers here at theEword. I asked them all to imagine that they were in the market for a new pair of Clarks Wallabees, and presented them with two hypothetical meta descriptions – one long, one short. Then I got each of them to vote privately on which meta description they preferred. Seven of the eight (87.5%) voted for Option B. So, based on those answers from my team, it sounds like most people prefer shorter and simpler, as long as the information is there. We do need to bear in mind, though, that my example was an ecommerce site trying to sell shoes – a quick and straightforward transaction. What if the searcher isn’t looking for shoes or any other everyday product, but is instead seeking in-depth information on a specific or complicated topic? A longer meta description would likely be suitable in that instance, because it would allow you more room to demonstrate your expertise, thereby convincing the user to click through. In summary, there’s no need to lengthen your meta descriptions just because you can. It’s all about what you do with your meta descriptions, not how long they are. The motion in the ocean. A longer meta description may stand out slightly more on the SERP, but if the searcher gets bored before they even finish reading it, then you’ve missed the point. As long as you word each meta description in a way that summarises the page and simultaneously allures the reader, it’ll do the job. So there we have it: nothing to worry about, unless your existing meta descriptions aren’t yet up to scratch – if that’s the case, you’ve got some work already cut out for you. If you’ve enjoyed this article, please share it on your social channels using the buttons just below. And if you have any questions at all for us, just get in touch! Either post a comment below or send us a tweet (@theEword). Need help with your content-writing efforts? Writing superb digital content is harder than it looks. With so much competition out there these days, you need to set yourself apart from your competitors. One way to achieve that is by having the most fluid, most entertaining, and most informative content within your sector or niche. For this reason, we’ve put together a comprehensive guide to writing great digital content. Take a look and download it!